Cancun Airport International (CUN) is the second busiest airport in Mexico. Twenty-one million people traveled through Cancun airport in 2016 which was a 9.3% increase over the prior year. Since its original construction back in the early 1970s, the airport has continued to grow and add new services to accommodate the increase in travelers. Dufry is a leading global travel retailer with operations in 63 countries. 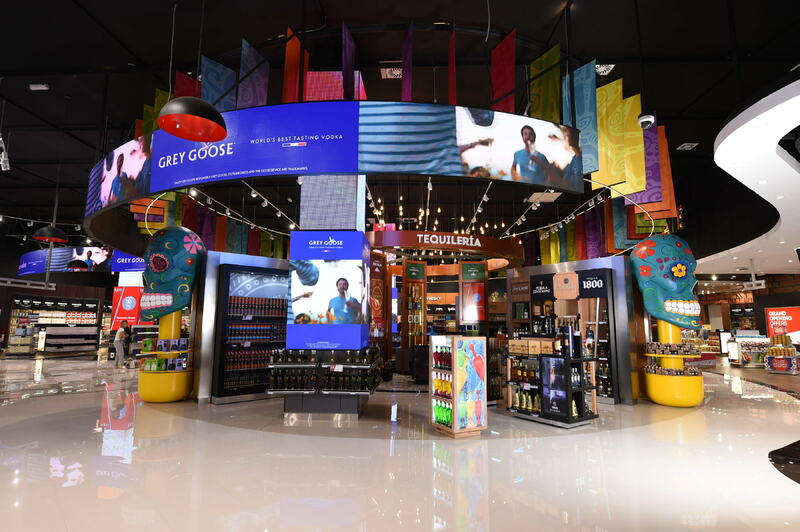 After the airport contracted with Dufry to open seven stores in a new terminal being built at the airport, Dufry partnered with the Aleatorio design firm in Madrid, Spain to complete the design for the high-profile project. Aleatorio came back with a design that was on-point, but Dufry had concerns about price, and logistics. The tiles that Aleatorio specified would need to be procured from multiple sources and make it to Cancun on a very tight timeline. Dufry had worked with Creative Materials in the past and knew that the team could handle procurement and logistical challenges under a tight deadline. Dufry provided Creative Materials with the specifications and floor plans at the end of July 2017. Of the 30,000 SF of tile specified on the project, the floor plans called for approximately 10,000 SF of the tiles to be water jet cut to achieve circular designs and radial transitions in the design. Dufry needed the tiles installed and the store ready for a grand opening on October 15th. Not only was the grand opening that day, but the CEO of Dufry and the President of Mexico were scheduled to attend! There was no margin for error in the project timeline and a lot was riding on a seamless execution. Creative Materials consulted with Dufry to find cost-effective, more logistically viable options for all of the specified floor tiles and partnered with The Water’s Edge water jet cutting facility, to provide the radius and circular cut tiles. The Creative Materials sourcing team offered several cost-effective matches to choose from and a 20-year relationship with The Water’s Edge enabled responsiveness in providing solutions. The Water’s Edge dedicated 2 crews to work round the clock over the weekends to make this deadline. Creative Materials managed multiple shipments from factories in Toronto and Alabama to the jobsite in Cancun and to The Water’s Edge facility in Iowa for processing, then back out to Cancun so that the project could open on time and under budget. Creative Materials’ logistics team coordinated with the various factories and with The Water’s Edge to move material across the border into Cancun at cost-effective and timely rates. The Creative Materials solution for Dufry involved finding 30,000 SF of tiles that would work for this fast-paced project, keeping the design intent intact, managing the shade lots and sizes to ensure the water jet cut areas were identical to the field tiles, and coordinating 4 different truckload shipments to Cancun that needed to clear customs. The location opened on time and has been thriving ever since; a second location at the airport is currently being developed.